The citizens of America are caught between the future and the past. The past represented a rigid society trapped within a strict confinement ruled by a feeling of guilt. The present generation of Americans has begun to remove the restrictive rules of the past and is teetering on the brink of disarray and destruction. Many of our citizens young and old are filled with anxiety, confused as they are inundated with an overabundance of consumer product advertisement and a political system on the brink of self-destruction. Are-You-Being-Set-Up-To-Fail carefully lays out for the reader how and why America’s mental health as a country is in jeopardy. The solutions offered are uniquely designed to help each reader gain control of their mental health providing them with a path to success using methods that will empower the reader for a lifetime. 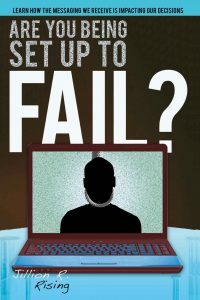 Once you have completed “Are You Being Set Up To Fail” you will be empowered by techniques that are uniquely designed to enhance each individual person’s characteristic traits. The methods used for encouragement allow each reader to build an inner strength that will stay with them for a lifetime! “This book is extremely thought-provoking and covers issues that are not normally discussed.